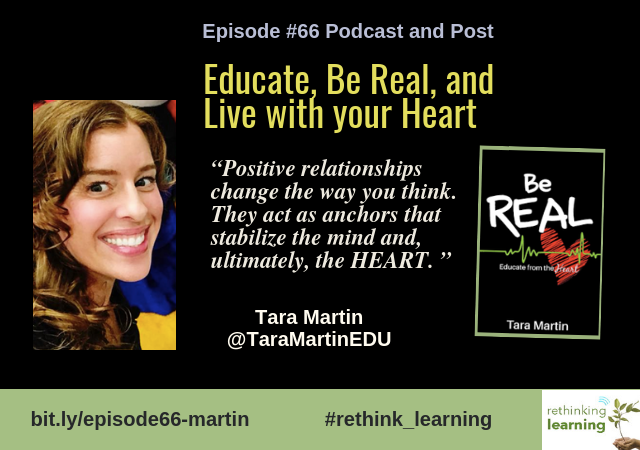 Tara Martin is an inspirational speaker and author of Be REAL: Educate from the Heart. Tara firmly believes machines and artificial intelligence will never replicate an individual’s REAL identity–the unique strengths, talents and life experiences of every human. Her story will touch your heart. Tara’s ambition is to lead a culture of innovative change and to motivate others to become the best they can be, all while staying REAL and yet never reaching a plateau. 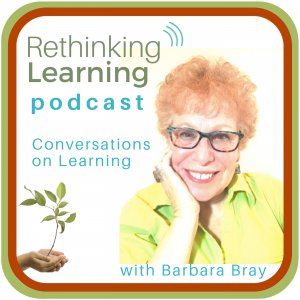 Listen to the podcast and check out the resources and excerpts from the podcast below. Enjoy! I grew up in Southeast Texas where we didn’t have seasons only hot, humid, and rainy. I moved to Kansas eleven years ago with my husband, Darrell. I met my husband when I was in high school and he was in college. As high school sweethearts, we have been married this past November 20 years. 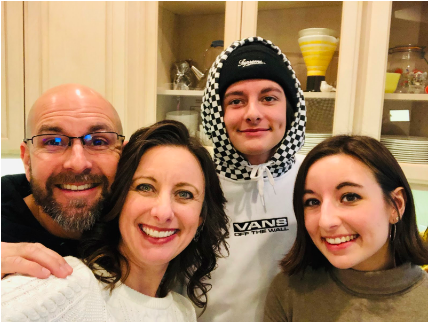 We have a sweet boy, Kaleb, who is 17 and a senior who got accepted into his first choice college so we are embarking on filling out scholarship applications. We live in Kansas out on a farm with no animals and absolutely love it here. We have four seasons in Kansas and my boys love the outdoors where I’m more inside, cooking, or traveling. As a student in Texas, I grew up in a home life that was less than stellar. It was an abusive home life. School became my safe place. It was the place, like Dave Burgess says, that I wanted to get in, not out. It didn’t matter if the teachers were engaging. It was my favorite place to be, ever. I got hot meals, hugs, and more. The school was a place I loved going to. Unfortunately, as an early elementary student, I struggled in school. It wasn’t easy for me. I wasn’t reading even when I got into second grade. My second-grade teacher, Mrs. S, was fantastic. She just saw this little girl that wanted to learn more than life herself and taught me to read every day when I got off the bus. It was so cool because I got to go straight into class when all the kids were lined up outside the class. I thought I was super special and didn’t realize that was getting tutored. I learned to read that year. I wasn’t aware of how she taught me, but that year I leveled up with my peers. From that moment forward I’ve always been a high achiever and excellent student. She saw something in me that inspired me all along to believe in kids and not to place them in a box or that their family is like this so they’ll automatically be like that. She gave every individual the chance to be the real them. That’s where BE REAL has been so embedded in my heart because every single individual has their own identity. They get to be what they want to be. Mrs. S told me, “I believe in you, Tara. You are an overcomer. You are not defined by your circumstances.” I am so thankful that she changed the wiring of my brain to make me think differently so I could believe that I could become whatever I wanted to be. I can still remember when she told me that, and I can still smell her perfume. It is so vivid in my mind. I call the words “I believe in you” HEART words. When people that matter to you say that to you, it means something. You can anchor your thought process on those words. I wanted to be a doctor, actually, a neuroscientist to study the brain and all facets of the brain. I went to school to be a nurse first because I needed to get a job to sustain myself. It turned out that I cannot handle blood and I almost passed out multiple times in the clinic. I realized that this was not for me. My scholarship also wasn’t going to be able to handle nursing school, med school and going on to become a neuroscientist. So my counselor worked with me to change my major. When I told her that I taught Sunday school and loved it, she mentioned that maybe teaching. So that summer I got into an intro to teaching class. One month in, I loved it. The coolest part is that all of the science I studied with the brain applied directly to education. Because you’re dealing with students and all these ways of thinking. It was cool to combine the two worlds together and to get into the field I belong to. I started teaching in an inner-city school in Topeka, Kansas with kids with 90% free and reduced lunch and a variety of socio-economic backgrounds and worked there six years. The students that I got to work with were much like me growing up. It was cool to be able to give back to children who were facing obstacles even greater than what I had to face. And being able to help them as Mrs. S encouraged me. I was a third-grade teacher so I had them young and I got to experience what it’s like to go into their houses that had no phone or email. I was able to meet the parents and just talk to them to help them to understand that I get it. I told them that I experienced something similar. I may look like I have it all together now, but this is not how it always was for me. I told them that we’re a team and want to help you. I’m very grateful for my experiences in Topeka. Parents watched out for me and each other. We became a classroom family. It’s so wonderful that my students stay connected with me through email and Facebook messages. 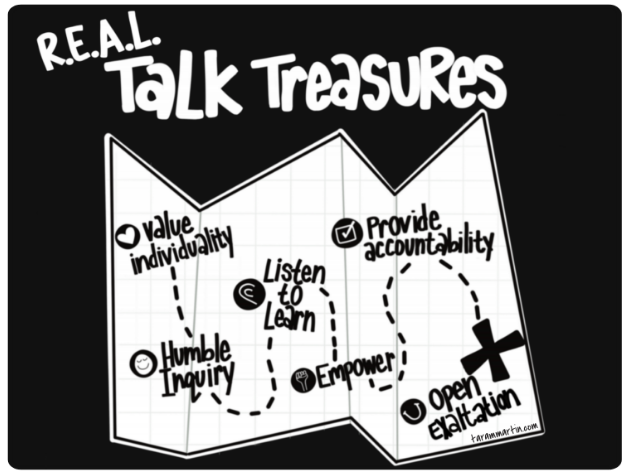 On my website, I share resources called Real Talk Treasures. Click the image below. I worked for four years as a teacher and then two years as an instructional coach in Topeka. Then I moved to my home district, Lawrence, KS, as an instructional coach. I loved coaching. It was my favorite. I first was trained by Laura Lipton and then later trained by Jim Knight who is in our home town. If you can learn to have effective conversations to help people recognize their strengths and strive for the next best thing in their own life, then you are really serving your purpose and the world. Coaching has always been something that I hold dear to my heart. I think no matter what role I am in, being a coach is ingrained in me. I later became an administrator of coaches at the last district I worked at was Auburn Washburn. I loved being able to start a coaching program from the ground up actually training them with this hybrid approach and a little bit of what I learned along with good conversations. Coaching is something that always happens you lead with a humble inquiry to tell me a little about yourself. Coaching is ever present no matter what role or professional you are in. I journal daily and even coach myself just like I do when I coach others. I’ll point out a few things they mentioned that we could take into bite-sized chunks to uncover things that clutter our lives. Educators have so much that is pushing on them and coach them to chunk it up to find out what they are already good at to accomplish some of their goals. It’s worth it to put in the time to listen and sometimes it is after hours. Taking to listen and learn at the onsite is worth that time. I now work for Dave and Shelly Burgess for their the Dave Burgess Consulting company as a coach and speak around the nation. My new role is Media and Communications Director and only work with educators. In the publishing and media side is completely different but I love the challenges. I am building this job from the ground up. Now YouTube is my new BFF. 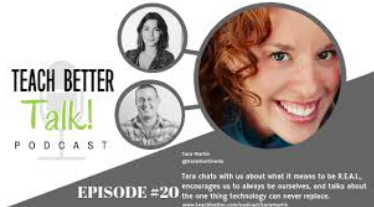 Tara Martin is an enthusiastic educator, speaker, and author who thrives on change and refuses to settle for the status quo. She has served as a classroom teacher, an instructional coach for several years, and most recently as a district administrator who leads district staff and school communities to meet the curriculum and instructional needs of the student body. Tara also mentored and supervised instructional coaches and provided job-embedded professional development for certified and classified staff. She is a well-rounded educator. 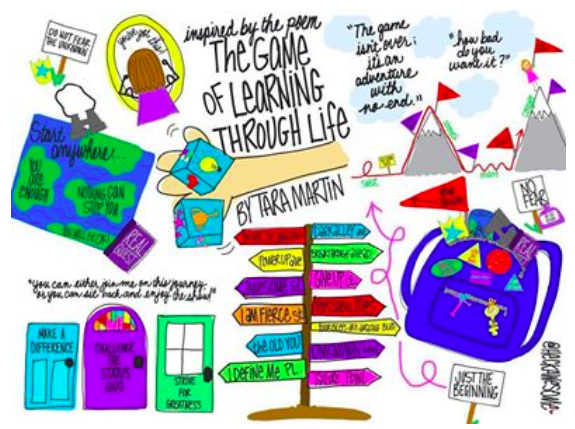 Tara is a passionate educator who speaks at various conferences to invigorate teachers, administrators, and staff members to apply instructional practices that foster creativity, personalize learning and increase student engagement. She is passionate about discovering the neuroscience behind instructional strategies and believes individualizing adult learning will enhance their ability to flourish and empower students to be the key drivers of their education. 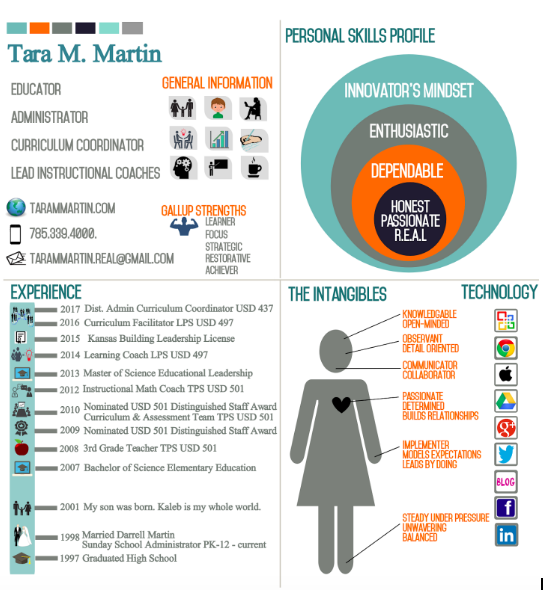 Tara is a connected leader who continually strives to grow professionally. She is always seeking unique ways to make learning fun, relevant and meaningful. 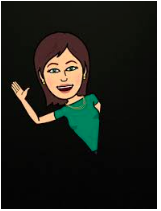 In fact, she is the founder of #BookSnaps, the latest reading comprehension strategy that utilizes Snapchat for EDU-awesomeness, and has taken the world by force in less than two years! Currently, schools in seventeen different countries have embraced #BookSnaps to increase student engagement and reading comprehension. 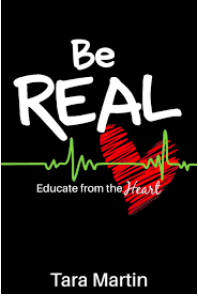 Tara is an inspirational speaker and author of Be REAL: Educate from the Heart. She firmly believes machines and artificial intelligence will never replicate an individual’s REAL identity–the unique strengths, talents and life experiences of every human. Tara’s ambition is to lead a culture of innovative change and to motivate others to become the best they can be, all while staying REAL and yet never reaching a plateau. 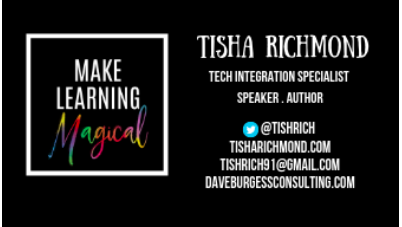 Tisha Richmond is a passionate and innovative Tech Instructional Coach and high school Culinary Arts teacher from Southern Oregon. 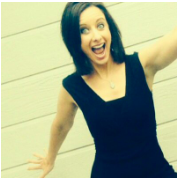 She is passionate about infusing joy, passion, play, and gamified strategies into classrooms to make learning MAGICAL. Tisha was awarded the 2018 Golden Pear High School Teacher of the Year award and speaks nationally on gamification and various innovative strategies. 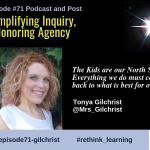 She is a connected educator that is continually collaborating, sharing, and learning with her Personal Learning Network. Her book Make Learning Magical was released by Dave Burgess Consulting in the Fall of 2018. Our conversation was so much fun. Enjoy! I have a beautiful family of four where we live in Medford, Oregon. 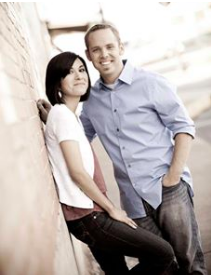 My husband, Russell, and I have been married 21 years. He is a ceramics teacher and teaches at the same school as me. We have two wonderful kids. My daughter, Ella, is a sophomore at Portland State University and is studying anthropology. My son, Tommy, is a junior in high school and is amazing as well. Both are brilliant and different in amazing ways. I definitely had some magical moments with magical teachers, but I really struggled in school. It was not easy for me. I was a really timid learner and fairly introverted as a child. I believe I was a very distracted learner and had a hard time keeping attention. 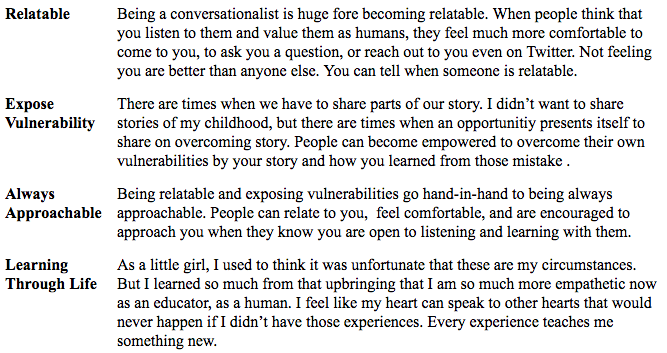 Those experiences that were magical really stuck out to me and an important part of my educational experience. My Consumer Economics teacher in high school had us play the stock market game where we were buying and selling stocks. I also enjoyed my Culinary class which, surprisingly, I came a Culinary teacher and loved the hands on. For me, to be in project-based classes and learn with my hands as an active learner was really important to me. Going into my junior year of college, I had a hard time knowing what I was going to major in. I started out as a business major, then maybe a dietician even though I wasn’t that good in chemistry. I remember my guidance counselor telling me that I had to decide to figure out what I was going to do with my life. She asked me if I ever thought of Family Consumer Science because that really brings what you love about food, nutrition, and being able to work with children and maybe broaden your horizon and teach things like child development, interior design, culinary, and other areas. My junior year was the first year Home Economics became Family Consumer Science major. It all kind of came together in that year. Once I found my passion with that major, I loved learning. Then it took me a while, but I became a really good student. It was all about me feeling confident in my own skills and abilities and finding what I was passionate about. For every kid, it comes at different times. My first teaching position was in Child Development and then they offered me to teach a Culinary class in Escondido, California where I taught for five years. When we moved to Oregon, I was able to stay home with my kids for five years when they were little. I ended up in a half-time position in Medford in Interior Design and Culinary. Going half time meant I could be with my children and go to their classes and also do what I love. After five years that transitioned into a full-time position. It’s been an amazing career teaching valuable life skills to kids. In 2014, I was at a point in my career that I was considering leaving teaching. I was tired, burnt out, and frustrated. Coincidentally, in that year, all the Culinary teachers who qualified for Carl Perkins funding that we get as Technical Ed teachers went in on a grant for a set of iPads. We earned it and received professional development money. I chose iPadPalooza in Texas. I had no clue all these amazing things were happening in education. I learned about so many resources, activities, and what you could do on Twitter. I saw this contest where you could submit a reason why you should go to this conference called Miami Device and create a digital presentation to share with the world then they would select a certain amount of winners. I shared it and I won. Transforming your classroom into a place where students are inspired, empowered, and immersed in their learning can be more than an illusion of smoke and mirrors. It doesn’t matter what grade or subject you teach…..you all hold the MAGIC! Discover it for yourself and change the way you think about teaching and learning forever! 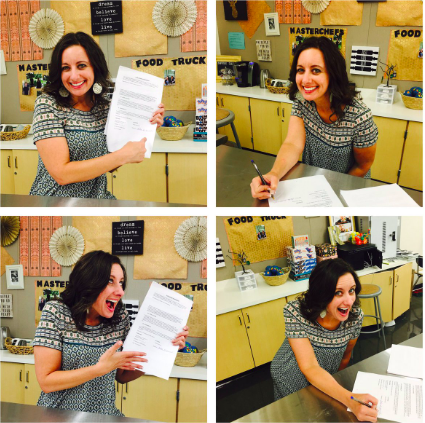 Tisha Richmond is a passionate and innovative Tech Instructional Coach and high school Culinary Arts teacher from Southern Oregon. 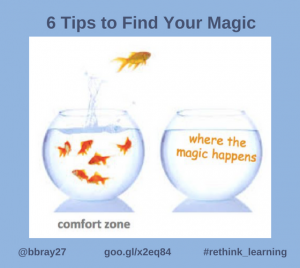 She is passionate about infusing joy, passion, play, and gamified strategies into classrooms to make learning MAGICAL. 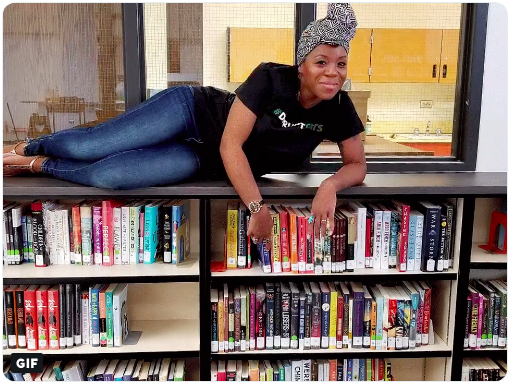 She was awarded the 2018 Golden Pear High School Teacher of the Year award and speaks nationally on gamification and various innovative strategies. 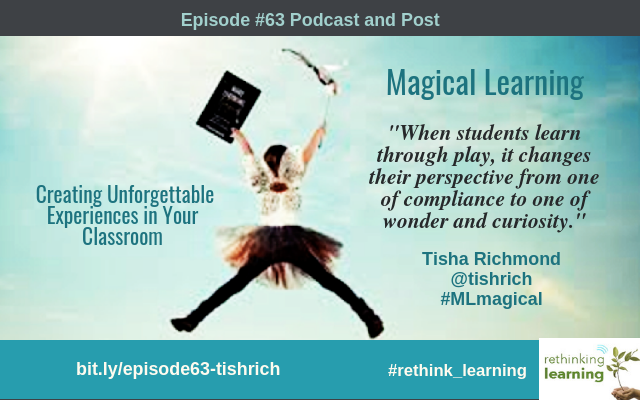 Tisha is a connected educator that is continually collaborating, sharing, and learning with her Personal Learning Network. Her book Make Learning Magical was released by Dave Burgess Consulting in the Fall of 2018. 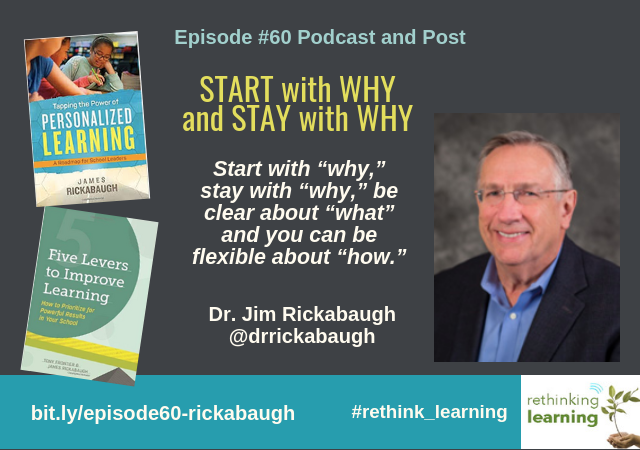 Dr. Jim Rickabaugh serves as the Senior Advisor to the Institute for Personalized Learning, an education innovation lab dedicated to the transformation of public education. Jim formerly served as the Director of the Institute for six years and as a superintendent in several districts in Wisconsin and Minnesota. 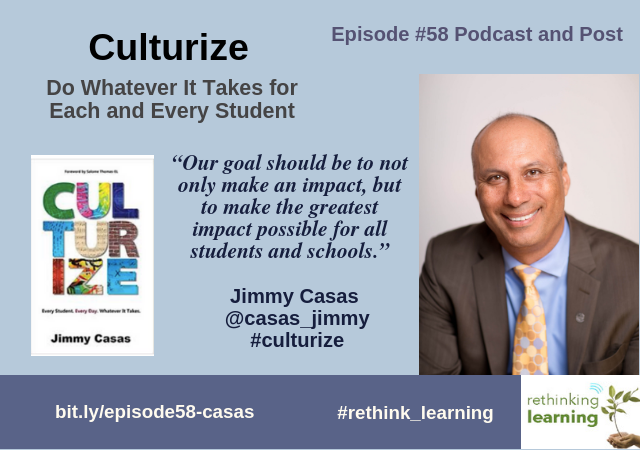 Jim is the author of Tapping the Power of Personalized Learning: A Roadmap for School Leaders and co-author of Five Levers To Improve Learning: How To Prioritize For Powerful Results In Your School. 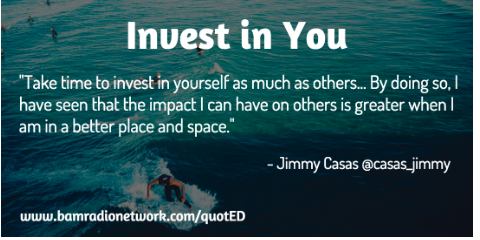 I have been fortunate to participate in several summits with Jim, attend his sessions at conferences, and collaborate on blogs about personalized learning. I learned some new things about Jim in the podcast. Enjoy! We are a family of educators. My wife, Lynn, has been a math tutor for a long time and so supportive of the work I’m doing. Our oldest son, Jay, with a newly minted Ph.D., is a professor at Appalachian State University. Our daughter, Christine, is an early childhood educator. I have spent more than 45 years in education with more than 20 years as a superintendent. I loved that. 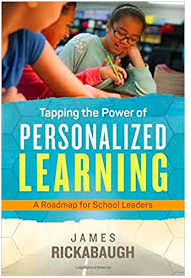 The work I’ve done for the last ten years around personalized learning has actually become all consuming and a fun journey. I tend to be an achiever. For me, a school was all about if a task or challenge was set up, I would go after it. When I think back to my experiences in education, what was missing often was the connection to purpose. Rarely, do I recall a specific or compelling purpose around learning? Being an achiever, my focus typically was around doing well on the test and getting good grades. I was fortunate to do well most of the time. The downside of that was how much I forgot because I learned it for the test, not for its inherent benefit or for other value it brought to me. Not that I forgot everything, but I saw the same thing happening with my students. When we learn for the task if that’s the driver or if we say “you need to know this will be on the test” and the test is over, too often what was learned is let go. It’s an unfortunate consequence for learning. The sad part is that even the act of learning tended to be very linear and focused what was going to be on the test. In the process, we ignored and failed to explore so much that would have been interesting, compelling, and enriching. No one ever thought to stop and talk about why we were learning that was value for us. Every once in a while, something would come along like a project or a concept that was so powerful that it transformed all of that and become a really meaningful thing. Unfortunately, that experience was more the exception that it was the rule. I’m the first educator among my parents and siblings. The choice to go into education was driven by two things. I wanted to make a difference in children’s lives and two there were educators I admired who were brilliant people who impacted me. One, in particular, was in eighth grade. We were doing a project exploring careers. I was having difficulty finding a topic, and my teacher, Mr. David Kitch, said to me, “Jim, you really should think about going into education. I think you’d make a great teacher.” I admired Mr. Kitch as a great teacher, and if he thinks I would make a great teacher, I should pay attention to that. 25 years later, I was visiting the school district I attended and Mr. Kitch was retiring that year. I was so appreciative of his encouragement and advice that I took time to call him and thank him. Mr. Kitch remembered me but didn’t remember the comment and was shocked that it made such an impact for me. For me, it was a driving force because he was such a brilliant teacher. If teachers only knew how much they made a difference in children’s lives, they would be absolutely humbled. Our influence becomes integrated into who they are, that they might even separate it. It is true that educators rarely know the full impact that they have on the students’ lives they touch. For many students who don’t have the support system at home, educators are their support system. I taught history and Spanish in a small high school in Wisconsin near Madison. Just before I graduated from college, one of my professors who I respected said, “so to be really clear, your graduation is not the end, it is the beginning. You might start working on your masters immediately. If you don’t, life happens and it will be more difficult later.” So my first year, I worked and started working on my masters and continued working while I worked on my Ph.D. while I was a teacher. I worked at that school for four years and then moved to the Chicago suburbs as a dean of students handling mostly discipline issues. 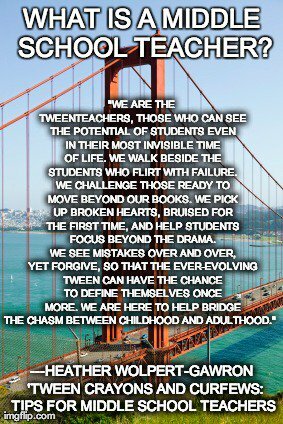 I learned a lot but I found my perspective about students was too narrow and unhealthy. So I pushed on to become a building administrator, then joined the district office as head of the curriculum, and then became superintendent at a suburb of Milwaukee. 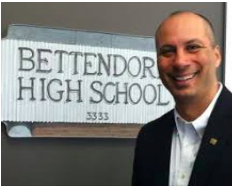 After that, I became superintendent of a district in Minnesota and then went back to Wisconsin to become superintendent of Whitefish Bay School District until 2010. There were a group of superintendents scratching our heads with two observations. One observation was that educators were working under more stress, pressure, and working harder than any of us could recall in our careers. Yet, we’re still not reaching so many kids. Our conclusion was that it is not that educators don’t care. The second observation was that in 2010 we were continuing to get more money for schools, but we found ourselves continually cutting programs. We committed to spending a year to see if anyone had figured out this issue. 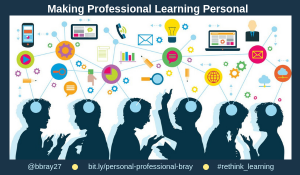 In 2010, people thought “Personalized Learning” was computer learning. We read everything and talked to everyone we knew. Ultimately, we came to a very obvious conclusion. The problem is not that people are working hard enough and the problem isn’t money. It’s that we have a school design that is not aligned to what we’re asking schools to do. All learning is personal, but we have a system as if it is a corporate activity. So it turned out that learning has always been personal. We knew that. We practiced that up until the point when we needed to prepare workers for industry and assembly lines. We asked ourselves how would we engage learners if we didn’t have the system we have? Suddenly, there are all kinds of really good options that engaged learners that were not engaged in the current system in far better ways. We ended up writing a white paper, Transforming Public Education: A Regional Call to Action, on this topic that is still on our website. We were lucky that CESA1 (Cooperative Education Service Agency) was willing to put money behind this for the first two years and then see if there was enough momentum to keep it going. It continues to grow by shifting into a pay-as-you-go model and operates on services we provide using the resources they had. Thankfully, we are coming up on the 10th year and there are over 60 formal memberships and supporting over 100 projects around the Midwest. There were 500 people from 13 different states represented at our last convening. It’s not always easy, but if people make those design decisions on the front end, then you are less likely to let it go later. Too often, good ideas have been left behind because the funding ran out. Not that the ideas weren’t good. It didn’t matter. The idea is for the each of us to own our learning and the system needs to support that process. There is always a mystery to learning and still confusion around personalized learning. That’s why the Institute continues and we are constantly surprised by what it does for the lives of children. We partnered with a research team at the University of Wisconsin, Madison to visit schools involved in personalizing learning. 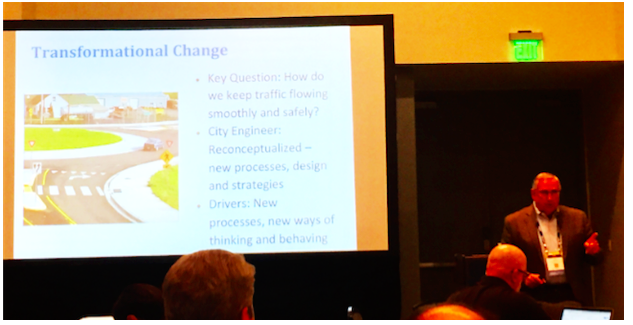 They had a question for us that they were struggling with: “Every place we go where this work is going on, why do they all look different?” They asked us about fidelity to the protocol, and we came up with it being fidelity to purpose. When you are really clear that we’re trying to develop capable learners, we’re promoting ownership and agency. These discussions really pushed our thinking. This idea of fidelity to purpose brings passion to our work. Dr. Jim Rickabaugh serves as the Senior Advisor to the Institute for Personalized Learning, an education innovation lab dedicated to the transformation of public education. The Institute serves a growing number of member school districts engaged in personalizing learning and is a part of the multi-state Innovation Lab Network coordinated by the Council of Chief State School Officers (CCSSO). Jim formerly served as the Director of the Institute for six years and as a superintendent in several districts in Wisconsin and Minnesota. Dr. Rickabaugh was Wisconsin Superintendent of the Year in 2008 and Minnesota Superintendent of the Year in 1996. He is a member of the boards of the Wisconsin Education Business Roundtable and the Innovative Schools Network and is a member of the Advisory Board of the Midwest Comprehensive Center. He received the Excellence in Educational Leadership Award in 2005 from the University Council for Educational Administration and a lifetime achievement award from the Master Teacher in 2010. Dr. Rickabaugh is the author of Tapping the Power of Personalized Learning: A Roadmap for School Leaders focused on helping principals and other educational leaders to engage their staffs in designing and implementing personalized learning ecosystems. 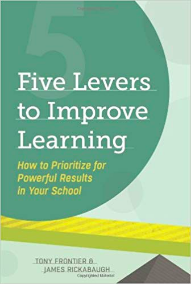 Jim is also a co-author of Five Levers To Improve Learning: How To Prioritize For Powerful Results In Your School. 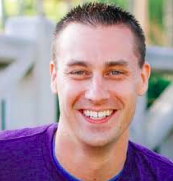 An engaging speaker, Jim has presented on personalized learning at several national conferences including the Annual Visible Learning Conference, ASCD Annual Conference, AESA Annual Conference and iNACOL Blended and Online Learning Symposium, among others. I had to rethink what word would be my one word for 2019. How can you pick just one? I thought I was going to choose “curiosity” and then I started going over the past year. What a year 2018 was for all of us! The world is changing so fast, but in too many areas, we are going backward. Our children need us to consider all the possibilities they can have for their future. We need to be there for our kids and help them make what may seem impossible, possible. That is my #OneWord2019: Possibilities. Last year my one word was “YET,” because I had put off doing some things out of a loss of confidence in myself. Yes, me!! I know I’ve talked to many of you about building yourself up, being strong, building confidence, etc. But I had lost some of my confidence about who I was, where I was going, what I wanted to share or not share. I couldn’t see the possibilities in front of me. I knew I was a good storyteller and could write, but it was like I had a writer’s block or something. I worked on it and talked with awesome thought leaders in my podcast who had the confidence I wanted. Actually, I thought they had that confidence I wanted. What I found out through all of the conversations is that many of them struggled with confidence and had difficult times as they grew up as I did. All of us struggle. 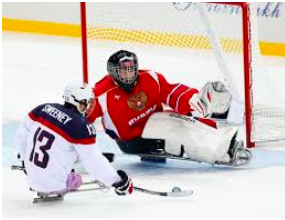 I heard this from my parents: “Life isn’t supposed to be easy.” If we couldn’t do something, we can try again. I learned through the conversations with many of the educators, that something changed them that helped them build their confidence. In most cases, nothing is holding us back but ourselves. I used my 2018 word YET over and over this past year. I changed and developed a growth mindset. I realized I could make mistakes and learn from them. YET was just that. I might not be able to do something just YET, but I could only succeed if I tried. So I did. I struggled, took risks, made mistakes, and got right back up and tried again. It’s that idea of learning, unlearning, and relearning. I was using the idea of YET, but something else was still holding me back. I see us considering “Possibilities” to achieve our hopes, dreams, and goals. I hope for peace, love, and compassion in 2019. I hope we see more random acts of kindness. I hope to share all the kind actions taken by people in my #PLN. Thank you Tamara Letter @tamaraletter, Roman Nowak @NowakRo, Hans Appel @hansappel094, and so many more who spread kindness and share stories. I see possibilities for kindness around the world. I dream about a world that uses empathy and finds ways to help people who are struggling. 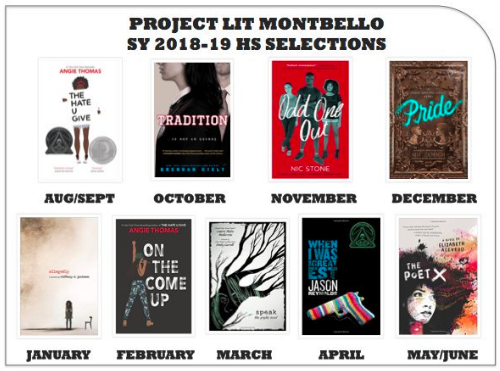 I plan to find more stories or seek them out on social media, through projects, and from EDUheroes and students who took risks to help others. We are on this planet together so we need to be there for each other. We can dream big, look at real-world problems, and design activities that make a difference. Dream with me so you can believe in all the possibilities. Just look at the kids who started #MarchforourLives. 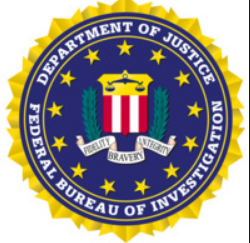 It is now an international movement. Nothing can stop them now. I just got accepted as an ambassador for the TeachSDGs Cohort 3. The possibilities are endless when you look at the 17 UN Sustainable Development Goals (SDGs). When you review the SDGs for 2030 and not sure what to do, you can start with Be The Change to take an action every day. Look at all the possibilities for students of any age to use the SDGs to research one of the global goals and how they can apply them locally. I’ll be writing about the SDGs more this year when I learn more. I really believe the possibilities are endless. 2019 needs us to take action around something we are passionate about. 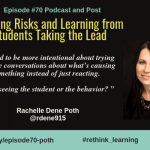 It can be the year all of us can be the change, take risks, and choose to redesign our learning experiences around authentic real-world problems. 2018 went by so fast. It has been a very interesting year in education along with every aspect of our world. Because of the changes, I needed to update some of my posts, graphics, and resources. 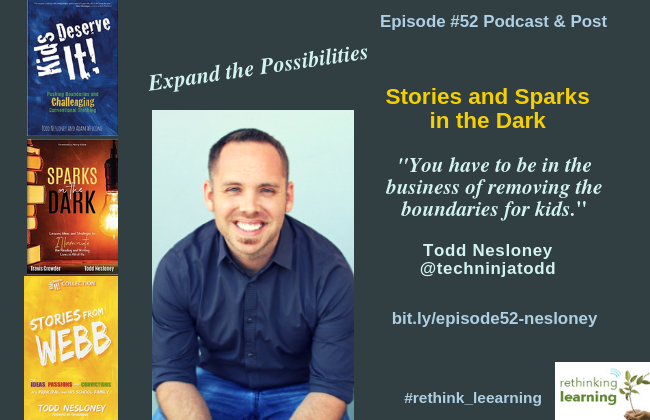 I have been fortunate to participate in amazing discussions at conferences, summits, and with awesome educators in my podcasts. I have learned so much from inspirational educators and realize that there is always something new to learn and share. Beyond the posts that go with each of the podcasts, I wanted to share the top 10 posts with you that others shared on social media. These are in no particular order. I just wanted you to have access to them from one page. There are so many aspects of “school” and “learning” where students have not been given the opportunity to be active participants. 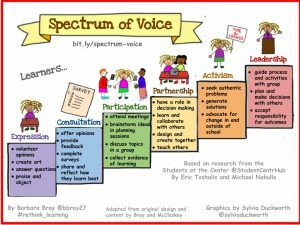 Giving students voice encourages them to participate in and eventually to own and drive their learning. This means a complete shift from the traditional approach of teaching compliance that develops a “learned helplessness” to encouraging voice where there is authenticity in the learning. Are our schools and universities preparing our children for the new skills they will need to be successful? How we taught and still teach our children in our K-12 and university systems is no longer sufficient. There is a sense of urgency about how we prepare our children and our adults for today’s world and their future. 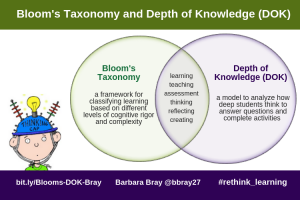 You can use Bloom’s Taxonomy as a guide for teaching and designing instruction and DOK as a guide for developing skills and encouraging deeper thinking and learning. How do you see both either working together or separately to support your teaching practice and the different needs of your learners? Teachers may find that they will be learning something new more often than not. Teachers are a valuable element in the classroom and mean so much to each student. They need to be valued and appreciated. 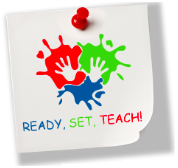 The activities need to be personal for each teacher. That is where teachers can take control of their own learning. 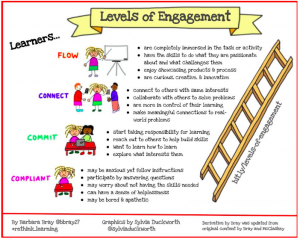 Engagement is about how much any learner is engaged in a task or activity and the balance between the challenge before them and the skills they have to meet that challenge. The levels are more about how the learner is engaged in learning, not about the teacher or the learning environment. This idea of levels of engagement can pertain to any of us who are defining who we are as a learner. Moving to learner agency takes time for students and teachers. Students may not be ready to let go. Teachers may not have the support, resources, or time to jump in and change how they teach right away. When teachers and learners build positive relationships first and a culture where everyone’s voice is valued, they will know when to change and try new ideas. 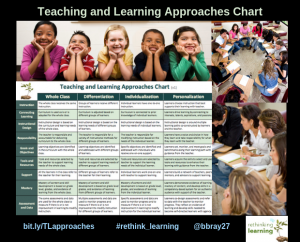 This chart is meant as a guide and to calm the fears about changing what they know and do around teaching and learning that I heard from teachers. Many teachers believe that providing a set of choices from a computer program or a list of options was enough to give students opportunities for choice. I see so many teachers working way too hard to create opportunities for students to choose the best way to learn. 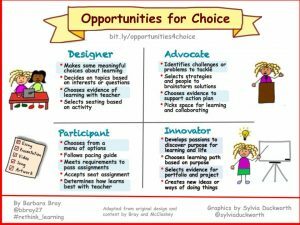 The idea of developing opportunities for choice is to turn over the learning so students learn best by having them be the ones working harder than the teachers. Humans are naturally social beings. The better the relationships are at school, the happier and more productive students and teachers will be. When relationships are working, everyone is happier, more innovative and creative. 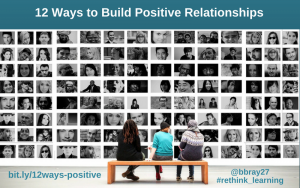 Building positive relationships with students, teachers, and all school staff in school will spill over to the school community. Developing ownership of learning takes time and that it doesn’t always happen in school. Most of us grew up in a system that valued sameness and compliance. Learners can move from compliance to autonomy by teachers creating an environment that provides learners with choices and opportunities for growth and ownership of learning. When a learner at any age pursues an interest that they are passionate about, they are motivated to learn and want to own their learning. Being uncomfortable is kind of the new norm today. The world is changing so fast that no one knows what is ahead for us. There is uncertainty about the type of work is needed in the future. That impacts all of us. You will be amazed at how you will be able to live with uncertainty easier every day and build a growth mindset about whatever you want to do. “What are the worst things that could happen if I go out of my comfort zone? What are the best things that could happen? I hope you enjoy these posts. 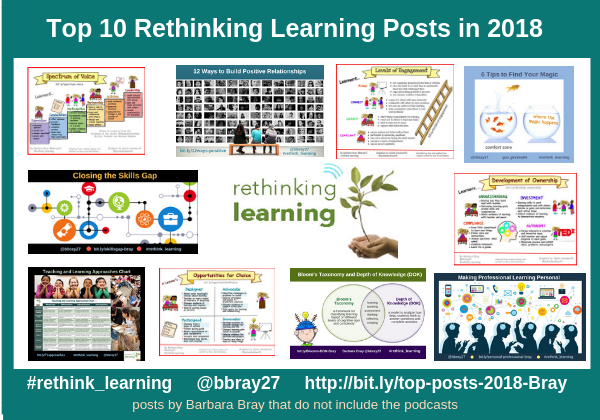 There are more posts I wrote and resources for you on Rethinking Learning. There is a complementary post for each podcast created by me and the person I interviewed. I guess I’ll have to create another post about why I started my podcast and decided to create separate posts with each one. I welcome any comments and encourage you to share any of the posts on social media. 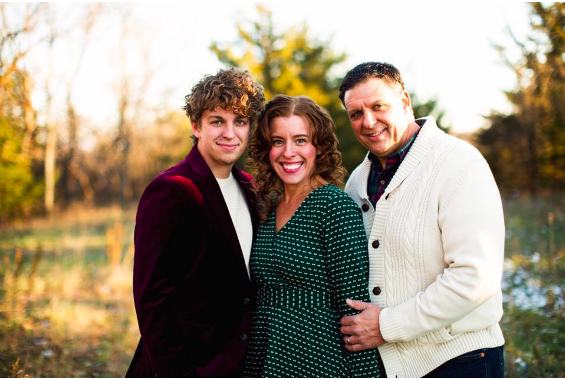 Heather Wolpert-Gawron is a middle school ELA teacher, 21st Century Learning Instructional Coach, curriculum design geek, and PBL coach. 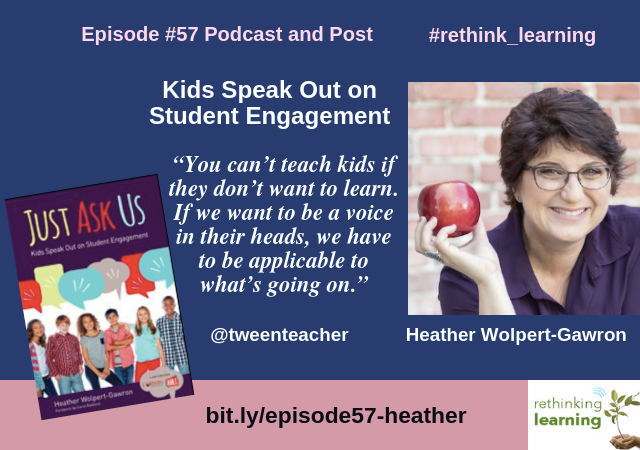 She has written many books including her latest, Just Ask Us: Kids Speak Out on Student Engagement. Heather blogs on her site, TweenTeacher and is a staff blogger on Edutopia, a Fellow of the National Writing Project, and a National Faculty member of the Buck Institute. I was fortunate to spend some time with Heather at the CUE conference where we geeked out. I just knew I had to learn more about her. It was a hoot having a conversation with Heather so I hope you get a chance to listen to her podcast and read the post we put together. Enjoy! I am wife to Royce, whom I met in 2nd grade, after karate-chopping him at recess. Additionally, I am a mom to two boys, both of whom always have leaves in their hair from some adventure or other. She lives with all of her boys and their boxer/corgi mix, their laughter, and chaos, in Los Angeles, CA where they play Dungeons & Dragons every week, building their cross-over stories and adventures together. You know how you never can find a picture of the whole family because someone’s always the one taking the picture? Well, here’s the most recent of us four. 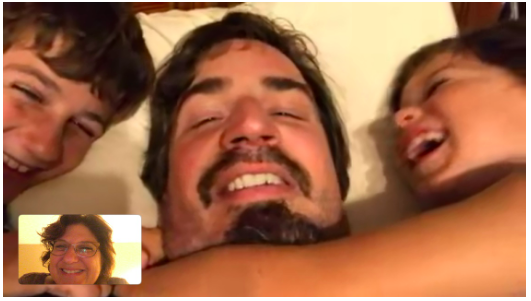 I was away presenting at the AMLE conference in Florida this year, and I end each night when I’m away either reading to the boys via Facebook or listening to them and their day. This was a typical day’s end moment of Royce trying to hold down the fort before signing off for the night. I was a real disengaged student. I went to some great schools but I found ways to do the minimum. I got easy Bs if I like you and tried harder and got some As, but I also got Cs and even a couple Ds in my time. I understand those kids who skirt through school never really being triggered by something exciting. So it was kind of a surprise for me when I realized I wanted to be a teacher which I found kind of late in life. 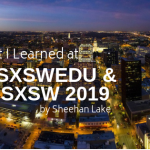 I went back to school for my credential again was another eye-opening experience because I sat there listening to how to collaborate and do hands-on learning by reading about it in a book. I realized that this lack of engagement was a theme not just in K-12 but beyond. That became a huge focus for me and fueled my interest in project-based learning. It also propelled me to write my latest book and to this passion for engagement. This quote from Kerry Gallagher stuck with me: “Engagement first, then content, then rigor in that order.” You can’t have it any other way. That’s why I am trying to bring engagement standards to the same level of importance as content standards. You can’t teach kids if they don’t want to learn. If we want to be a voice in their heads, we have to be applicable to what’s going on. 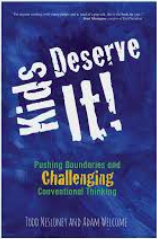 What do we do with the kids that do not know how to play the game of school and are disengaged? Being boring is offensive to me. I mean, you are in front of kids. Some teachers heard a message early on that misled them. I think that they just have to rewind to who they were. 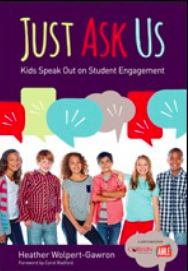 In the book, “Just Ask Us,” I share the results of my nationwide survey of 6th-12th graders. In that survey, I asked one simple question: What engages you as a learner? No matter what model of school, what state, what type of environment (rural, suburban, city), every response that came in could be sorted into the same 10 categories of strategies. One of those strategies is that they just want to know you, their teacher. Some teachers believe they need to be that academic authority. The kids really want to hear your stories, what makes you laugh, about your family, and your similarities. The research showed that can decrease the achievement gap just by sharing commonalities between the students and the authorities in the room. This is why I love Project-Based Learning (PBL). It gives us an outlet as teachers to embed some of the things that we love into the curriculum itself so we are excited in a different way than we like the content area. I love literature but I have to tell you that there are some books that make me yawn. How do I get jazzed about what I am doing all the time? Being jazzed trickles down. Loving to learn trickles down to the kids. So how do we make that happen in the classroom if we’ve been teaching the same thing for 10 or more years? 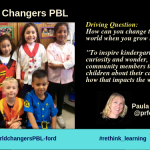 For me, the answer is PBL and bringing the kids along on this story of learning. They get to be the characters and they can learn about each other and from each other. Let them teach each other. I think role-playing has a huge (no pun intended) role to play in school. If we can trigger role-playing in these kids, whether they are in the role of teacher, journalist, architect, artist, or whatever it might be, then they can be learning through the research what it takes to do that role. Then they can share that expertise with other students. That means you have to be in the sandbox with them. I’m looking at PBL from the lens of design-based, passion-based, genius hour, 20% time, and all the various incarnations that bring in student-centered research-driven learning. It’s about breaking down the wall of school life and real life. Our kids are in school for 12 to 18 years and to think that school is real life to them. It is up to us to make it authentic. PBL plays a wall in the authenticity of school. 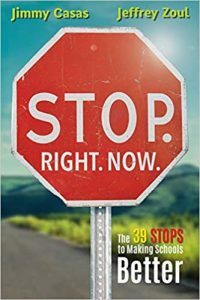 The evidence shows that if we want the content to stick, we have to have it more student-centered and have kids be engaged. The way we have been teaching isn’t working. If our goal is for kids to learn more deeply, it seems to me that we have to be evolving in our practice. This is Barbara. There’s more… make sure you listen to the entire podcast with Heather. I learned so many great ideas and giggled with her. Hope you take time to learn, read her book, and maybe geek out like we did. 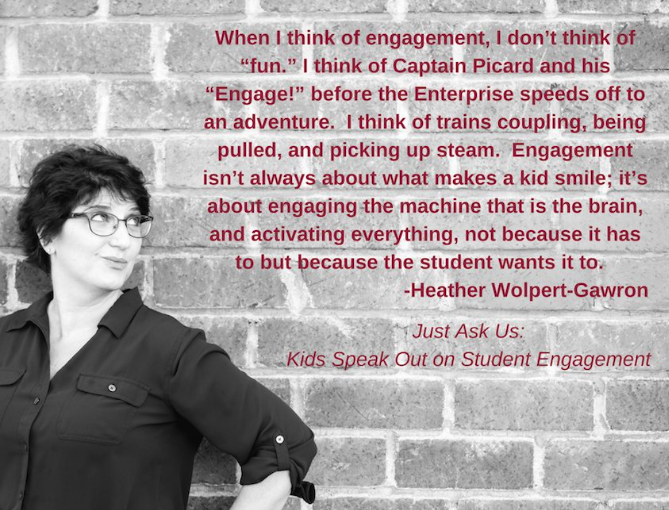 Heather Wolpert-Gawron is an award-winning middle school teacher, coach of one of the largest middle school Speech & Debate teams in the country, and enthusiastic curriculum design geek. 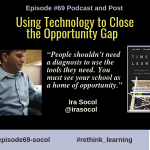 She coaches teachers in developing their own Project Based Learning units and works to help tech-tentative teachers become more tech-tenacious. She is passionate about educational technology and its role in helping students communicate all subjects. Heather helps her students become agile in 21st Century technologies so that they can be a part of the conversations to help develop the technologies for the next century to come. 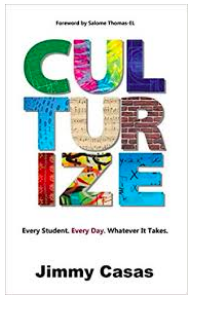 A 21st Century ELA teacher must focus, she believes, on communicating curriculum in an engaging way while teaching students strategies to communicate their passions themselves. Students must be able to communicate any content in a meaningful and current way; teachers, she believes must move beyond teaching content and must become more agile in focusing on strategies to communicate that content. Heather writes a popular education blog as Tweenteacher and is also a staff blogger for The George Lucas Educational Foundation’s Edutopia.org. She is a Fellow of the National Writing Project and a National Faculty member for the Buck Institute. Heather has a Masters in Instructional Design and Technology with an online learning emphasis, and she believes that the teachers’ Maker Movement is in original curriculum design. Heather tells stories through her curriculum units, and her students help to craft the content’s tale. Heather was the featured educator for the USDOE Connected Educator Profile of 2013 and the San Gabriel Valley Computer Using Educators Outstanding Teacher of the Year for 2009. She is a professional speaker, appearing at many educational conferences. She also has designed and presented webinars for multiple educational organizations, websites, and publishing companies. She has worked with numerous districts and schools to help all grade levels to develop, implement, and enjoy their adopted curriculum. Julia Torres is a Librarian and Language Arts teacher at a public high school in Denver, Colorado and writes and publishes on Medium.com for her students and the wider audience. 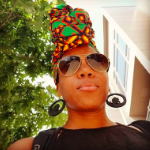 As an advocate for all students and public education, Julia facilitates workshops and professional conversations about equity, anti-bias/anti-racist education, culturally sustaining pedagogies, and literacy in the digital age. I met Julia at the 5Sigma Conference at the Anastasis Academy in Colorado. As soon as we started talking, it seemed like we had always known each other. I sat in her session about teaching tolerance and knew that I had to connect with her. We kept in touch, saw each other at SXSW, and just had to follow up with a podcast. Enjoy the podcast and what Julia wrote and shared below. Let’s talk about you and your family. I am originally from Southern California, but when I was a teenager, I lived in Brazil and this changed my life. My father died when I was young, and my mother raised me. She is bilingual (Spanish and English), so she taught me Spanish from birth. In Brazil, where I lived for one year and have been traveling on an almost-yearly basis for the last 23 years, I learned Portuguese, which I consider to be the language of my heart. As such, multiculturalism and multilingualism is a big part of who I am. I currently live and teach in Denver, Colorado where I am lucky to work in the largest (and only urban) school district in the state. I have taught Language Arts since 2005, and am currently what is termed a teacher-librarian. 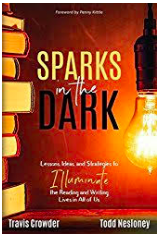 My main job is to help students re-ignite their passion for reading by finding new and creative ways to introduce them to books, authors, and the written and spoken word. What was it like when you were young and in school? When I was young, I remember liking school because I was a very curious person. I was also always in a book. I have always been a passionate reader and a secret writer. I remember school being easy because I was one of those kids who just knew how to do school. Language arts was always really easy for me, but math was where I struggled. My math classes traumatized me. Friends who are math teachers now chastise me all the time for labeling myself as “not a math person”, but I still think it’s true! I cried a lot because of my math grades. I was that person with all As and a D bordering on an F–in math class. I remember school being about impressing the teacher with how well-behaved, obedient I could be, and how well I could do what they wanted. I definitely suffered from “pretty brown-girl syndrome” in which we are taught to be quiet, obedient, and twice as skilled as anyone else…I internalized the lesson many Black women are taught by society, that you have to be twice as good to receive half as much. Half as much pay, praise, half as many rewards. I knew that I would always be punished for the slightest misstep, and rewards would seldom if ever come my way…only after working very, very hard. It is for this reason that I consider myself and so many other Black women I know to be masters of our crafts. We often have no choice not to be. What is your passion? What you love and want to learn? Every once in a while, I read books about metaphysics and/or astrology. 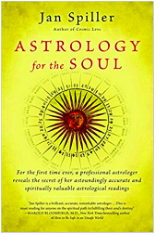 I read one recently called “Astrology for the Soul” that offers a pretty simple way of calculating your North and South Nodes. I won’t go into that for folks who don’t believe in such things, but the basic message was that I am at my best when I’m with children or teaching people how to best serve children. When I read those words I was SHOCKED. It said that IN PRINT. It blew me away. It said a lot of other things, like I’m supposed to be working with words and literature because working with such things would be gifts I would be given to help me with my primary mission of working with children, but the way this has all manifested lately is that I just love helping kids love reading again. Too many of our children in what are labeled “Title 1” “Low-income” or “Hard-to-Serve” schools–and I use those labels begrudgingly, because no situation is that simple, right? But anyhow, I will use the language I have to say that too many children in school environments like mine have had their love of reading systematically stolen. The high-stakes culture of testing coupled with an unhealthy and irrational fixation on forcing “The Classics” down students’ throats leads to secondary students in grades 6-12 associating reading with pain, suffering, insecurity, in short, misery. I dedicate every day to doing something about this. Part of it is because I love reading so much, and I consider it an honor to be paid to help children love it too, but a bigger part is that I know that their ability to fully participate in life will be dependent upon their relationship with words. Take somebody’s language away, and you’ve taken away a huge piece of their humanity. As so much of my work is oriented toward anti-racist teaching practices, I believe that this work is an essential part of liberatory education. How do we, all of us, celebrate our differences? And then teach our children to do that? We should definitely teach children to celebrate differences, but in order to celebrate them, you first have to learn not to fear them. Humans are wired to fear differences. But, what are we here for if not to evolve. I don’t jive with the folks who say, “This is my lizard brain, that’s just the way we are wired. There is no moving beyond it.” I disagree. I think we are at this stage in human evolution where we can and should work to move beyond it. That’s what this global interconnectedness and the great thing called the world wide web has afforded us–a chance to work together, connect, share passions, and make the world a better place. I recommend Jesmyn Ward–all Jesmyn Ward. Her books will change your life both with the stories that are told, the emotions they will bring out of you, and the sheer craft behind them. Lately, I’ve been working hard to go back in time and fill in some gaps from my miseducation, so Assata Shakur’s new Autobiography is helping me to do that. It is not only Black people who need to reclaim our history, but all people also need to reclaim whole slices of history that they were not fed. Go get after them. As for YA or kid lit, I can’t pick favorites, but I’m definitely on an Ibi Zoboi kick right now. She has an anthology coming out called Black Enough that needs to be part of EVERY creative writing class everywhere– probably every 9th grade English class. It’s just a bunch of dope, beautiful, creative people who came together to write these beautiful stories of Blackness. The Poet X is another one that will change your life. It speaks to the bilingual soul, and despite what has historically been the case, more and more of us are bilingual. Monolingualism is not a thing, so folks need to stop referring to students as “monolinguals” when they are such themselves. 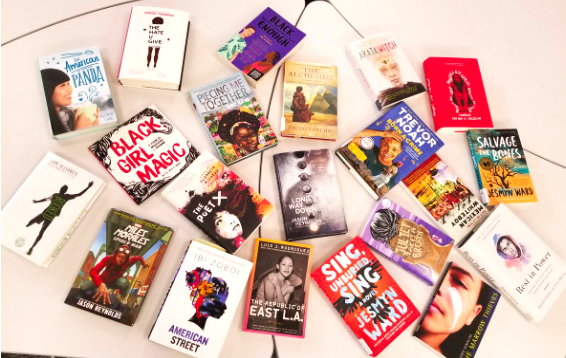 Just because a student only speaks Spanish, but YOU only speak English does not mean they are somehow deficient and you are not… Two more: Jason Reynolds–all Jason Reynolds books and Trevor Noah–Born a Crime along with some books on my table. What does librarianship look like these days? Julia E. Torres is a Language Arts teacher at a public high school in Denver, Colorado. She finds humor in everyday moments with her family, friends, and students she teaches. Julia’s favorite genres to read are biographies, historical fiction, poetry, and creative non-fiction. Julia has had the great privilege of traveling to Mexico, Canada, Iceland, Bermuda, Switzerland, Germany, France, Italy, and Costa Rica. She lived in Brazil as a teenager and continues to be close to her adopted family and friends who live there. Many pieces that Ms. Torres writes and publishes on Medium.com are for her students to read, and the wider audience of her peers in the field of education. She believes in students having a reading and writing teacher who is also a reader, and a writer. As such, she does her best to model the types of writing she asks students to produce, then shares them with a real audience, as real writers do. “Ms. Torres”, “Miss”, “Torres”, or “Mama T”, as her students call her, enjoys teaching writing primarily because the field is constantly evolving in both content, and form. She also feels that now, more than ever is the time for students to develop their voices and use them to produce positive change. 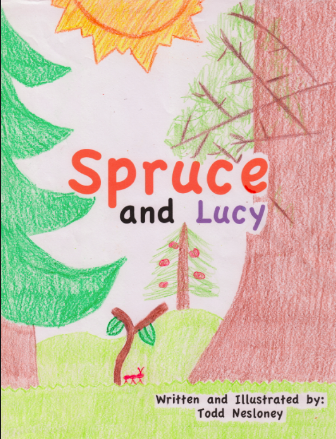 Julia feels that helping students develop their own personal writing voice and style is the gift that keeps giving. She remains passionately committed to amplifying student voices by any means possible. Teaching, aside from her family, is Julia’s greatest love. As an advocate for all students and public education, Ms. Torres regularly undertakes speaking engagements, facilitates workshops and professional conversations about equity, anti-bias/anti-racist education, culturally sustaining pedagogies, and literacy in the digital age. She also serves on several local and national boards and committees that promote educational equity and progressivism. 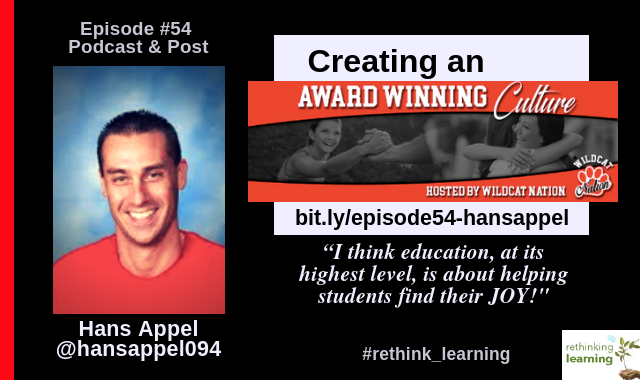 Hans Appel has been a Counselor at Enterprise Middle School in the Richland School District in WA for the past 17+ years. 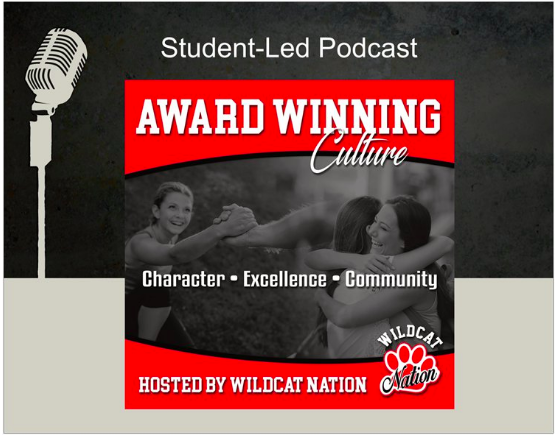 Recently, Hans launched his own blog about School Culture and this fall rolled out a student-led leadership podcast called Award Winning Culture: Hosted by Wildcat Nation. Hans is absolutely driven to helping students and educators find purpose and joy in life. Just listening to his passion when he talks about school culture and Character Strong made me want to learn more about him, his life, the kids, and his school. Below are excerpts from our conversation. I was born in Westfield, New Jersey, and an only child. My family moved to Corpus Christie, Texas when I was a little kid. My dad was a chemical engineer and my mom was an art teacher and interior designer. When I was in second grade, we moved to Richland, Washington so he could work at the Hanford Nuclear site. I spent most of my life here and went to Hanford High School where I met my wife, Jennifer and been married for 19 of the 24 years we’ve been together. Jennifer is a passionate educator and teaches at the same school as me, Enterprise Middle School, as a Language Arts teacher and teaches leadership. We are fortunate to work together and talk the same language. We don’t have children of our own. Our kids are the kids at our school where we spend our energy. 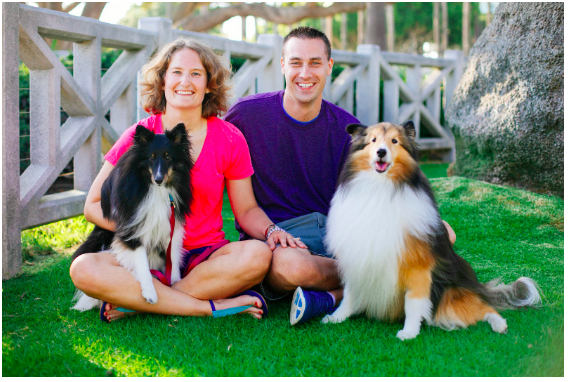 We have two dogs that are Shelties who are babies who we love and spoil. We live in the city of Kennewick which is in the Southeast corner of Washington and is much drier than Seattle. It is more like the climate of Napa, CA so it is conducive to growing wine. A school was good up through elementary school. Middle school was where school got really hard for me. My parents were fighting a lot in kind of an abusive home and not the greatest situation for me at that age. Learning in school really became secondary. I didn’t get good grades in middle school and didn’t find my own until high school where I got into sports. I’m 6’4” so I was a basketball player. The more I got into basketball, the more I realized that grades mattered. I had to keep my grades up to stay eligible, but that is also where I started getting excited about my education. I went to Central Washington University which was 2 hours away. I took business and psychology classes. The more psychology classes I took, the more I realized I was more into human behavior and how to help others. While I was in college, my parents went through a divorce, and I became their mediator. This was a weird role to play as a 19 or 20-year-old kid, but I kind of helped both of them through that experience. So while all of that was going on, Jennifer was in the education program. She had come from a long line of educators who asked me if I ever thought of education. As I took more psychology classes and was learning to help others, it just felt like a natural fit. When I was graduating with a masters in school counseling and because of my own experiences, I knew, unequivocally, that I only wanted to work in middle school. I believed that was where the kids needed me the most. Wildcat Nation is Our Brand. We have spent a few years building that brand. Joe Sanfellipo has this quote that really stuck with me. Character: Will you do the right thing? Excellence: Will you do your best? Community: What will you do for others today? The first 30 minutes of every Friday, students learning one of those aspects of education. Students loop with their teachers so they build relationships with their teachers that last three years. It has been pretty successful for a while, but we decided it was time to update our social-emotional curriculum. 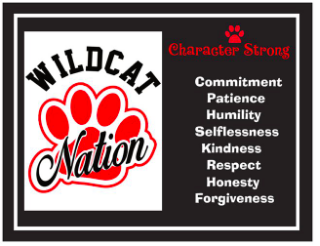 We found in our research CHARACTER STRONG that was created by John Norlin and Houston Kraft who have combined character ed and social-emotional learning. We realized we were missing the character ed piece because character really gives social-emotional the why. Instead of teaching kids what not to do, it’s more a proactive way of teaching them how to be kind, to serve, and use empathy. It’s highly experiential because it gets kids up and moving around. Not only in lessons, but there are also challenges outside of advisory. They do things called “Character Dares” where they are asked to do things in the community, in the school, in other classes, and at home. There is part of this program that will move you to tears and impactful for teachers and students. The two-day training I had a year ago on Character Strong was the best professional training that I’ve had my entire career. It was a life changing event for me and highly recommend it for other educators. It really helps you deeply discover your why and is so powerful in how you can use that message to change the world. Every morning, our kids greet others as they come to school. There are high fives, fist bumps, and music playing. It’s so powerful. No matter what the weather is, the kids make everyone feel welcome to our school. We have something that we call “Golden Broom” which is a demonstration of service to those who serve us. It is really special when we recognize people like our custodian and had the kids work for the custodian for 30 minutes to give him a break. They also made hot cider and cookies and brought those to the bus drivers. Those kinds of things were sprinkled throughout the year. It started because our school was getting attention and people wanted to see what is the special magic that is happening at Enterprise Middle School. John Norlin and Houston Kraft reached out to me to start writing some blog posts for Character Strong just sharing our story. That basically morphed into having other people at our school writing. So we asked educators and others LA Teacher, Parent, B-Ball Coach, Math Teacher who were experiencing the magic like I was. What they found was that those were some of the most popular blogs that were posted on Character Strong. When the students started sharing their stories, that’s when I got excited about student voice. 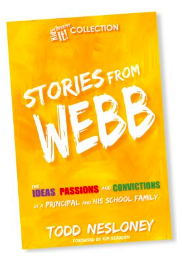 In early Spring 2018, I attended the annual SERVUS Conference in Kent, Wa where students, speakers, authors, celebrities, and athletes showed up with 7-8 hours of inspiring work. Just imagine all the best leadership minds in your state together in an arena to learn from each other. I was listening to some of the speakers and there was this holocaust survivor that was talking. I mentioned to my wife that we need to make this happen more than once a year. Hans Appel has been a Counselor in the Richland School District, for the past 17+ years and at Enterprise Middle School since it opened in 2005. He’s passionate about school culture, servant leadership, and kindness. 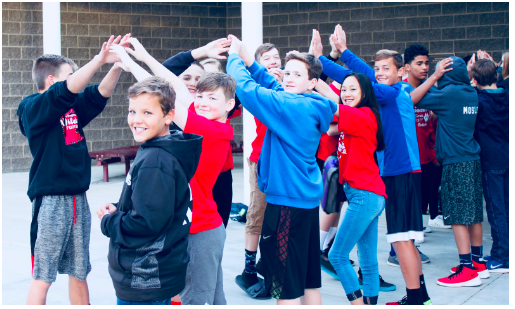 In 2018, EMS was awarded the ASCD Whole Child Award for the State of Washington, for creating a culture of excellence through kindness, service, and empathy. 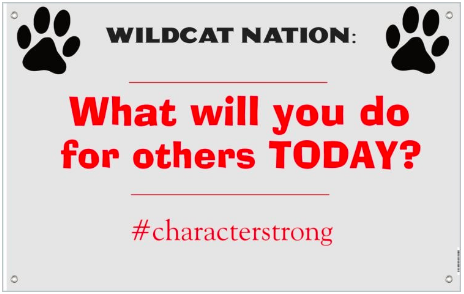 Additionally, RandomActs of Kindness chose Wildcat Nation as the 2017-2018 Global Class Act Winner for “making kindness normal.” Recently, Hans launched his own blog about School Culture and this fall rolled out a student-led leadership podcast called Award Winning Culture: Hosted by Wildcat Nation. Hans is absolutely driven to help students and educators find purpose and joy in life.